What are you doing this Saturday night? Getting dressed up to drink with your dog? Awesome! Bring Sparky out with you for a night on the town, because man's best friend is officially invited to this shindig. You and your pooch can plan on spending a night of art, food drinks and fun to benefit animals. PawCasso, a live art auction, will benefit Homeward Trails Animal Rescue, featuring work from 35+ local artists, including Zachary Sasim (painting pictured), plus live jazz, food and drinks. A silent auction will include restaurant gift certificates, vacation home stays, yoga classes, private plane rides and more. 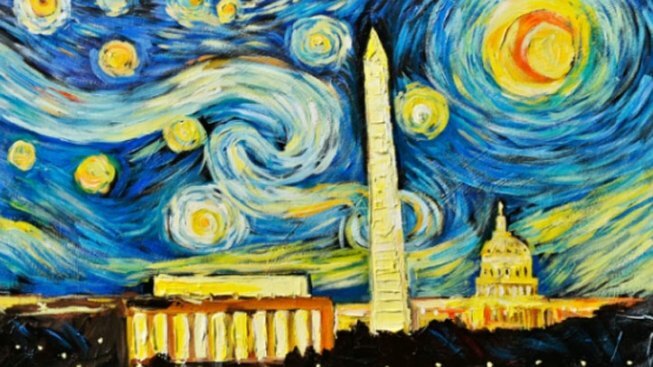 PawCasso runs from 6 to 11 p.m., Saturday, April 16, at the Washington Post Building (1150 15th St. N.W.). Tickets are $55 a person, or $65 if you bring your furry friend.